The idea to add a university in Asia to the preexisting Ohio-Leipzig relationship is something that Stewart and Werner Suss, Honorary Professor of Communication Management at Leipzig University, had been toying around with for some time. The timing was good when lecturers from Hong Kong Baptist University (HKBU) were selected as SUSI scholars to participate in the Study of the U.S. Institute on Journalism and Media, administered by Ohio University’s Institute for International Journalism, for two consecutive summers. The idea to engage HKBU with the E.W. Scripps School of Journalism quickly transformed into a reality when SUSI 2014 scholar Bonnie Chiu approached the school to initiate some kind of collaboration. 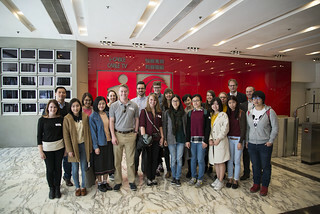 Most recently, students from Ohio University, Leipzig University and Hong Kong Baptist University met in Hong Kong during the first week of March as part of the recently developed triangle partnership between the three universities. While in Hong Kong, students attended seminars and worked together to develop cross-cultural research project proposals in just four days. They spent most of the time at HKBUs Shaw Campus in Kowloon, and also visited Stanley Market on the south side of Hong Kong Island. Over the course of the past couple years, students and faculty members from OHIO and Leipzig University have had the opportunity to visit one another’s schools as part of study abroad programs. But the new triangle relationship with HKBU has introduced new engagement activities such as conferences and research workshops. While in Athens, students from both Leipzig and Hong Kong have participated in homestays with current students. Keeton-Olsen is one such host. This mutually beneficial exchange is what makes this level of partnership flourish.